Ticks are hard to detect, but can leave a trail of destruction that is anything but. With the Preventic Dog Collar, you get up to three full months of around the clock protection from nature's littlest vampire. Once the collar is on, it starts working within 24 hours. Resistant to water, there is no need to worry about being caught in a sudden shower (although it is recommended that the collar be taken off before a bath or swim time). 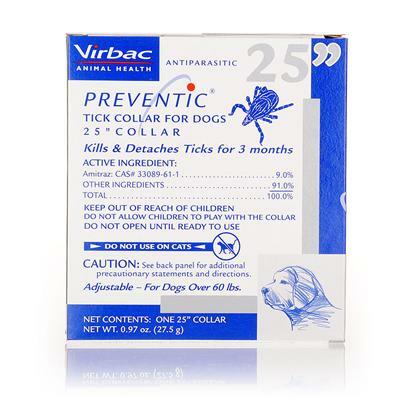 It should be noted that the Preventic Dog Collar only protects your dog from ticks, and not against fleas or heartworm. Other medications should be used in conjunction with the collar to guard your dog against all forms of pests looking to make your pooch their host. There are no known side effects but be sure to remove the collar at the first sign of skin irritation or adverse reaction. Fasten the Preventic Dog Collar around your dog's neck, adjusting the size to ensure that the fit is comfortable and the collar is securely touching the skin. Note that the buckle is in place. Remove the collar before bathing your dog, and replace it only once the pet is dry. Replace the collar every three months. The Preventic Dog Collar is available in two sizes to fit both small and large dogs.